Professional Grooming at Your Door! 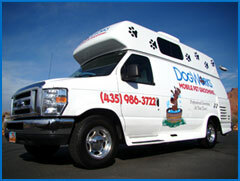 DogWorks Mobile Pet Grooming, LLC offers a convenient alternative to maintain your pet’s grooming needs. We specialize in taking care of your dog or cats entire grooming needs. Why spend your valuable time driving to and from a grooming shop? when We come to your home or office when convenient for you. Our fully equipped, state-of-the art mobile unit comes right to your home, housing a complete climate controlled facility, our own water and electricity, the same as a salon only it’s on wheels. One-on-one, cage free personal and professional attention with your pet at your doorstep can make your pets grooming experience a lot less stressful. So, before you call a traditional pet grooming service contact us and learn why DogWorks Mobile Pet Grooming, LLC service is right for you and your pets. You’ve been there, your pet gets a bath and instantly turns into a crazy marathon runner through the house, rubbing on the couch, the carpet, and walls happy as can be. Well here at DogWorks we experience that also and understand how important your pets are to you as we are pet parents too. is to ensure that your pet has an hour of luxury bathing and pampering when we visit. We only use the finest vitamin enriched conditioning shampoos and crème rinse conditioners available so that your pets coat and skin is rejuvenated.